I’ve been experimenting a little bit with shooting panoramas with my 70-200mm lens, zoomed in to 200mm. 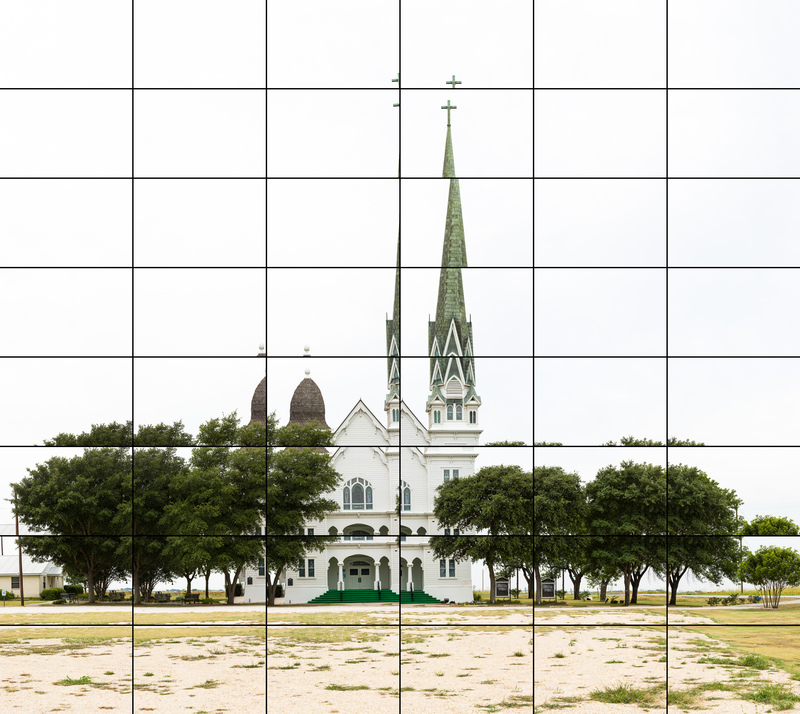 The black and white church image above was taken in this manner, requiring 48 shots to obtain complete coverage of the area. (The area extends somewhat on all sides of the above crop.) The same shot done with a 50mm lens takes 12 shots—which is what one might expect, I suppose. 200/50 = 48/12. It’s black and white because the day was overcast and ugly, and the color version merely serves to underline just how ugly. The final image, as shown above, measures 20,068 pixels square, or about 402 megapixels. But really I’m just glad that it stitched as well as it did. There’s only one spot I could see where it doesn’t seamlessly line up, but it is only visible at the largest size. 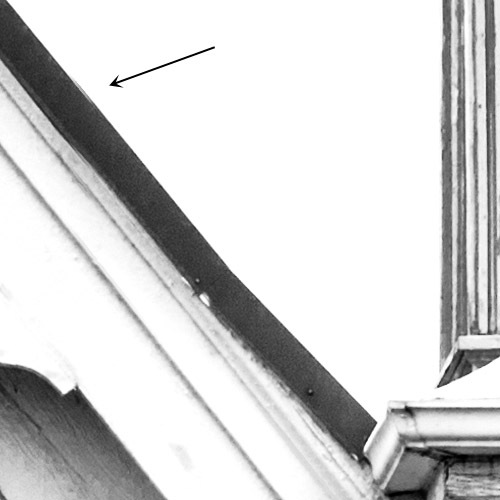 And it’s on the central roofline, too—not in the trees or some obscure place. The reason I’m surprised at the stitching’s not being worse is that I was just guessing as to the “nodal point” of the camera/lens apparatus. To make panoramas that stitch properly, one has to position the camera so that the optical center of the whole rig is placed directly above the vertical axis of the tripod, both left-to-right and also forward-to-back. It’s relatively easy to eyeball the left-to-right positioning—one can see whether the lens is over the tripod’s center. But determining the forward-to-back positioning is a matter of trial and error and close observation. You have to pan the camera back and forth with two fixed objects in view, one near and one far. When you pan left and right you observe the amount of parallax that occurs between the two objects. If they stay in the same place relative to each other, you have no parallax and you have found the right front-to-back positioning for that camera and lens and focal length. Problem is that zoomed in at 200mm, one can only pan about 7.5º before the objects leave the frame . . . and I can’t tell how much parallax is happening. Have only tried this in my apartment so far, though—maybe I need to go outside. At any rate, I’m pretty confident that I’ll be able to get good results without buying more equipment. I was planning on buying the Really Right Stuff PG-02 VA with B2 LR II clamp, which is the newer and beefier version of their CRD rail (mine has a panning clamp on it). I thought I would have to hang the camera off the back of the vertical component, as with the standard 3-rail panoramic setup—which, with the 70-200, is too heavy for the old-skool panning clamp on my existing vertical rail—but as it happens, I seem to be able to clamp the 70-200 right into my existing vertical rail and obtain acceptable results. When I get my 600mm lens, I’ll revisit this question . . .
Here’s what the individual shots look like arranged in a grid. I assume that the misalignment of some of the pieces results from my guessing at the positioning of the camera, but don’t know for sure. 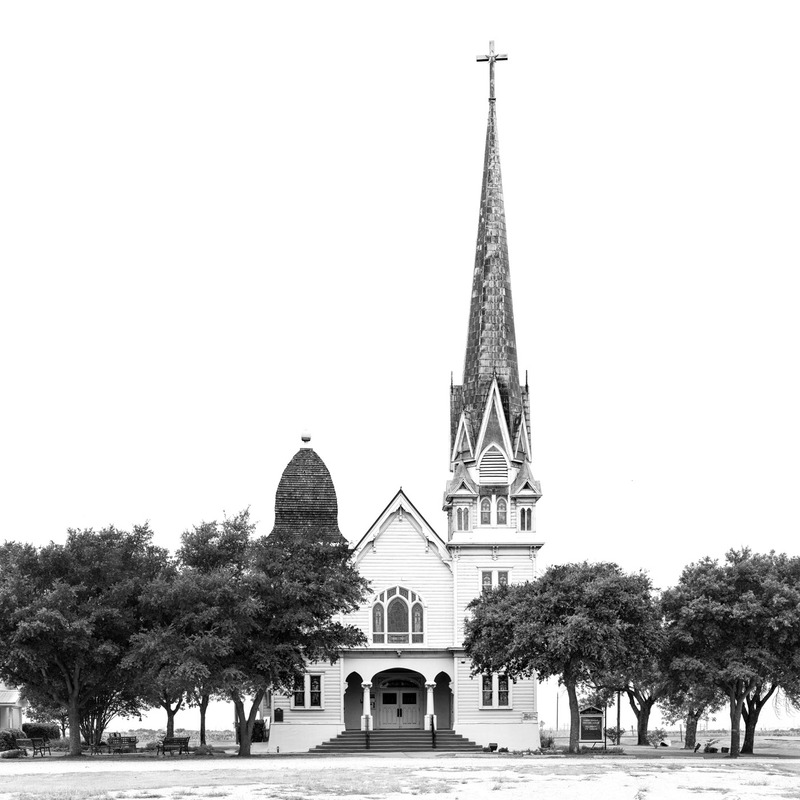 This entry was posted in Architecture, Panoramas and tagged 200mm, 70-200, church, Manor, New Sweden Evangelical Lutheran Church, panorama, Texas by Arlen. Bookmark the permalink.